Happy Tuesday! Guess what happens in 10 days? I know it's hard to imagine but it's National S'mores Day. And what do bloggers do to celebrate? We of course make up a bunch of S'more recipes of course! Last year I did a S'mores Brownie. This year I had to think of something that was better than last year, how could I possibly do that? Then it hit me, combine the two things my kids love together, cake pops and S'mores. So I bring to you S'mores Cake Pops. Make your boxed cake per instruction in a 9 x 13 pan. Put 3/4th of the cake mix into a bowl, and crumb with hands. Saving 1/4 for when you add in your frosting, you want to make sure that your cake to frosting ratio is good, so just in case you add too much frosting, you can add some more cake into the mix. Once your cake is crumbled, add in about half a can of frosting. You want it to be barely wet, too much and it won't stay together later on. Use a small portion (maybe enough to make a 1-1.5 inch ball) and roll into a ball, this step is not completely necessary, but when you're starting out it make sit easier to visualize where to put your marshmallow. Take two small marshmallows and put in center of cake ball. Put the tray of cake balls into the freezer for about 5 minutes. Meanwhile, crush up about 6 graham crackers. You can use your food processor for this, but when I was making this I had some napping kids on my hands. Melt your Chocolate Melts. 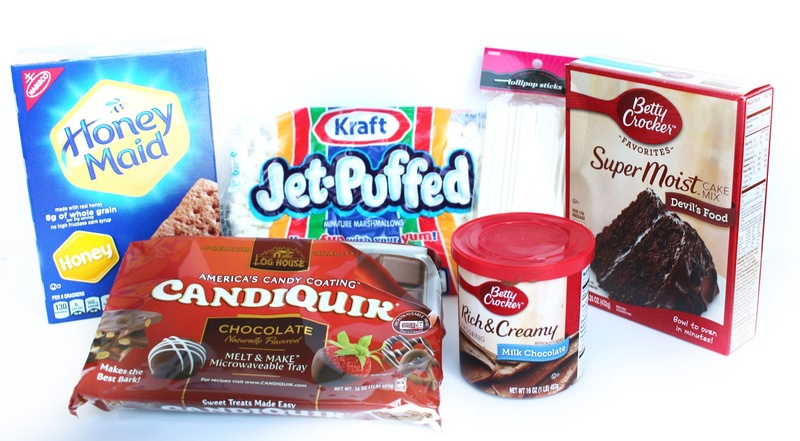 I like to use CandiQuik, found at Walmart or online. Follow directions on the melts that you buy. 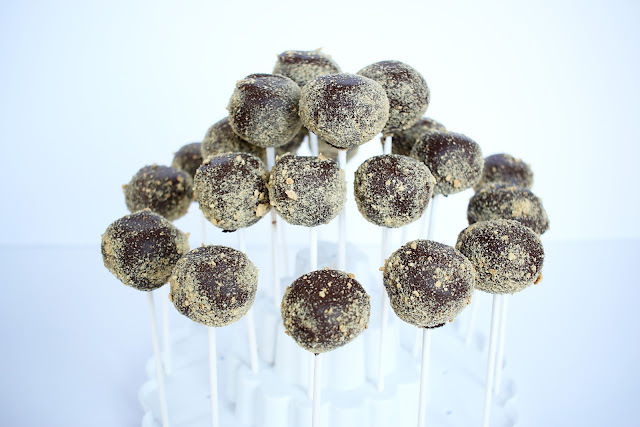 Take cake pops out of freezer, and dip the tip of the lollipop stick into the CandiQuik and place into cakepop balls. Once all of the lollipop sticks have been placed, put back in freezer, for 5-10 minutes. You'll probably have to re-melt your CandiQuik, and dip cakepop balls into chocolate. Make sure to really tap the excess chocolate off, this could take 30 seconds to a minute depending on how much is on there. 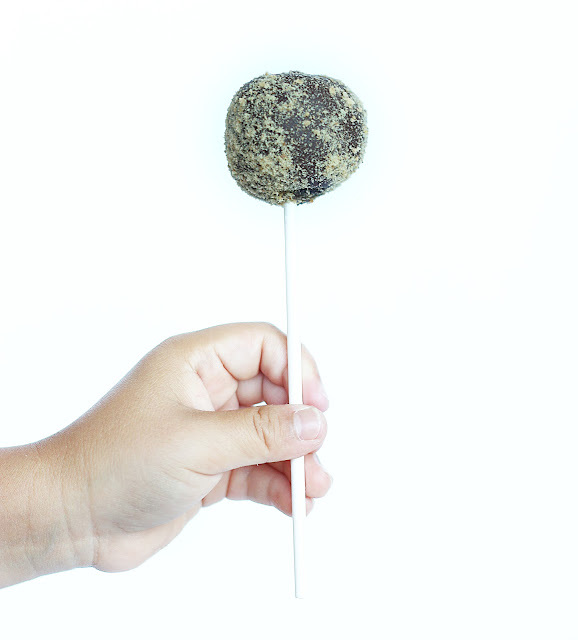 Using your hands, drizzle the crushed graham crackers over the outside of the cakepop. I took them to work, because there was no way we were going to eat all of these, and the people at work loved them. The kids and Mr. also gave them a thumbs up. NOTE: I tried to use marshmallow fluff, but it made the inside of the cakepop super fragile and when I did the taste test with some friends, everyone said they liked the ones with the real marshmallows best. I made 4 different kinds and made my friends try one of each. They didn't complain much. Here is the cake pop stand I'm using. For those of you that are more a hands on, show me how to do it, I also made a video for you! Take a look, and please like the video so more people can see, thank you! Now go check out some of the other ladies participating in National S'mores Day!